Hi!! I’m back with another recipe! This one is a favorite on my mom’s side and it’s not surprising why. Eggplant is chock full of vitamins and antioxidants. More importantly, it’s practically a soft flavor sponge. Even better, unlike most other braises, braised eggplant doesn’t take forever. While a perfect vegetarian dish, we usually add minced pork for extra flavor and texture. With that said, let’s get cooking! Heat oil in a wok and cook the meat for 2-3 minutes. Add a pinch of salt to taste. Remove from heat and set aside. Add a bit more oil in the wok. Fry garlic until golden, then add the eggplant. 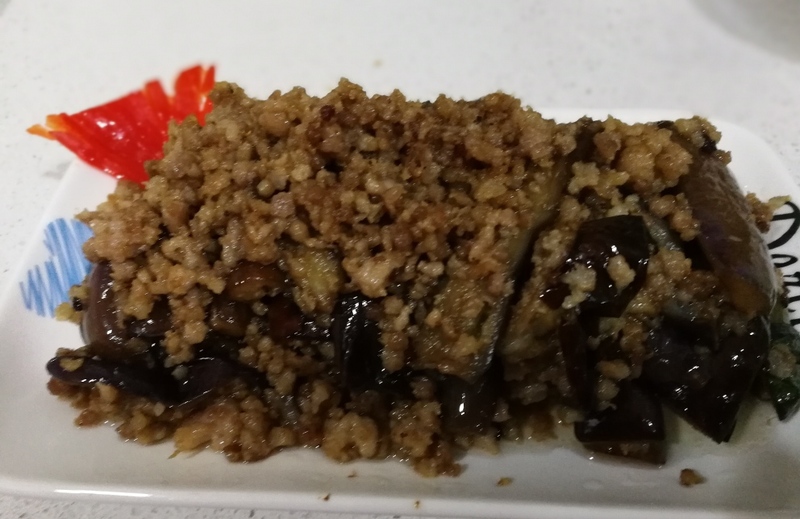 Reduce heat to medium and stir fry eggplant until soft. Add the meat, soy sauce and enough water to cover the vegetables 80%. Once boiling, reduce heat to medium, cover, and cook for an additional 5-10 minutes. The liquid should be mostly reduced. Serve and enjoy! I hope everyone enjoys this simple and delicious recipe!